Pip (1941) and Catherine Holmes donated two Emily Carr original paintings, which they had received as a wedding gift from Pip’s father, Major Cuthbert Holmes. In accordance with Pip's wishes, the school had copies made and sold the originals at auction in May 2006. The proceeds established the Pip and Catherine Holmes Trust Fund which will provide financial assistance in perpetuity for worthy students who would not otherwise have the opportunity to experience a Brentwood College education. We are enormously grateful to Pip and Catherine for their generous, visionary gift. Philip ("Pip") Despard Pemberton Holmes, son of Henry Cuthbert Holmes (co-founder of Brentwood College and Governor from 1923-1944), graduated from Brentwood in 1941 and went on to Victoria College. He joined the Royal Canadian Air Force in the spring of 1942, graduated as a Pilot Officer in April 1943 and was posted overseas. After intensive training, he was selected as a Pilot with Bomber Command and posted to No.6 Group, Squadron 433, located at Skipton-on-Swale, Yorkshire, England. In just a few months he was promoted to Flying Officer, Flight Lieutenant and then Squadron Leader. Pip flew Halifax and Lancaster bombers over Berlin, Hamburg, Dortmund and other German industrial centres as the Allied bomber offensive attempted to destroy Germany’s capacity to keep producing weapons of war. He was barely out of his teens and less than two years away from playing on the Brentwood 1st XV, when he flew the first of his thirty-three bombing missions over enemy territory, for which he was awarded the Distinguished Flying Cross. When the war ended Pip returned to Victoria in 1945 and joined the family real estate, mortgage and insurance company Pemberton, Holmes Ltd., established in 1887 by his great-grandfather, the first Surveyor General of Vancouver Island. In the 1950’s Pip was part of the group of real estate agents who promoted the need for further education in the real estate profession and who ultimately instituted mandatory courses and a diploma before earning the designation of licensed realtor. Pip proved a leader in his profession on the provincial, national and international stage, and was the first Canadian to be elected World President of the International Real Estate Federation. In 1973 he was made an Honorary Citizen of the City of Victoria. Mr. Holmes was Honorary Colonel of #11 (Victoria) Service Battalion, and for 33 years Aide de Camp to six different Lieutenant-Governors of B.C. In 1999 he was awarded the Vice-Regal Commendation. Pip and Catherine loved to sail and travel together and to entertain in their home in Victoria. Pip passed away in May 2007, and Catherine six months later in December. 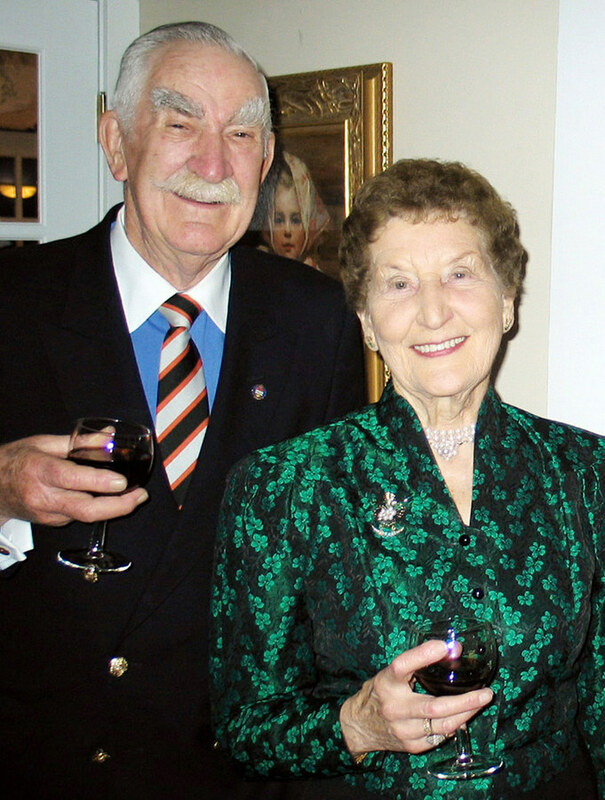 The Holmes family's association with Brentwood spans four generations, starting with Cuthbert Holmes, who was one of the school's co-founders. His three sons, Desmond (1939), Pip (1941) and Vincent (1947) all attended Brentwood. Two of Desmond's sons, Michael (1978) and Peter (1979), are also Old Brentonians, and his third son, Richard, had three children graduate from Brentwood - Alex (1994), Tara (1998) and Morgan (2002). The strong ties developed with four generations of Holmes' continues to this day. De manu in manum, the intent of the Pip & Catherine Holmes Bursary is to inspire future generations of scholars to become leaders ready to serve the communities, including their alma mater.